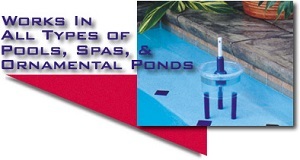 Check A Leak works in all types of pools, spas, & ornamental ponds. Easy to use, accurate, saves water, saves chemicals, prevents costly repairs, and most of all,... saves you money! Automatically compensates for rain and evaporation. This product is developed out of decades of experience and helping tens of thousands of families deal with the age old question: "Is it leaking, or is it evaporation?" Check-A-Leak serves a multitude of purposes. For the Home Owner: Within 24-48hrs a home owner can accurately identify if their pool is leaking. This unit automatically compensates for rain and evaporation. This tool can also help the home owner identify if the leak is in the "shell" of the pool, or in the equipment/piping. For the Pool Service Company: Leaking pools are more costly to maintain, waste natural resources and can cause thousands of dollars of damage to equipment if run "dry". For the Pool Builder: Most pool builders produce a quality product and many builders use this tool to show the customer that their pool isn't leaking! This professional piece of equipment communicates a level of quality, commitment, and thoroughness to the consumer. For the Leak Detection Company: This piece of equipment is more accurate than the "Bucket Test" and raises the level of professionalism, quality, and service to the consumer. For the Pool Retailer: Leak questions have been a labor intensive, low margin area of the pool industry for decades. This piece of equipment is sold retail to the consumer and the "Professional" model (Lexan) is used as a rental in many pool retailers across the country. For the Home Inspector: The best home inspectors use this piece of equipment to provide an additional level of completeness to their assessment of prospective homes for buyers.